Happy Friday, everyone! I’m getting ready for dinner and the BSU/Idaho rivalry game (go Broncos). Just a reminder, if you haven’t entered CSN’s guest giveaway yet, you only have a week left! Someone’s going to win a $45 gift certificate, just in time for holiday shopping! This week I thought I’d share some of my favorite crochet freebies. I’ve said before, the online stitching community has given me so much, and I try to give back in my own way. One of the ways I can give back is to share links to their projects. The brown socks I just finished came from Mrs. D Crochets – they are her Intuitive Shell Socks. 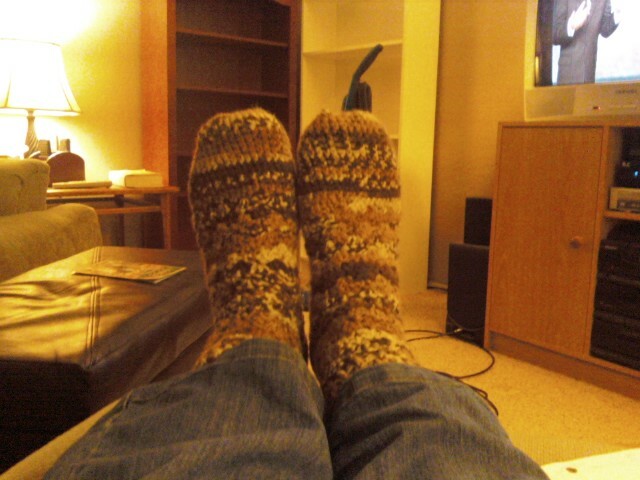 I made them with a worsted weight yarn that was 80% acrylic/20% wool, so they’re bulky, and more like slippers. Awesome if your ankles get cold! Another favorite crochet designer of mine is Kristine from Ambassador Crochet. She is a Ravelry designer, she has a great Etsy shop, and she does free stitch tutorials on her blog. It’s so fun to learn a new way to “bend” yarn. Her most recent blog post is “Tips for Teaching Children to Crochet”. Kristine is a great writer. If you crochet, you should follow her! Last one, because the smell of my chicken is making me hungry!!! I follow Rachel from Crochet Spot on Twitter. She has a ton of free patterns, including a sweater pattern designed by a 13-year-old crocheter.